Learn how to make hand puppets for kids in this easy make & play project by Danielle Falk of Little Ginger Studio. Have you ever wanted to make hand puppets for kids? Well here is a fool-proof no-sew puppet-making project that can be enjoyed by kids of all ages (and their grown-ups). Kids LOVE playing with their own special puppets and this project is sure to end in a hilarious child-produced puppet show! I’ve found over the years that puppet shows can coax even the shiest children to participate. I have used them often in my other life as an English as a Second Language specialist in elementary schools. Creativity weaves it’s magic again! assortment of craft supplies for decorating: sequins, buttons, feathers, beads, craft foam, pipe cleaners etc. Carefully push a foam ball onto the skewer to form your puppet’s head. Cover your foam head with a piece of skin-toned fabric and secure with an elastic band. Cut a shiny or patterned piece of fabric into a square about 15″ square and cut two slits in the middle to create a small hole. Slide the fabric over your puppet head (like a poncho!) and attach securely with another elastic band. Younger children will need help with these steps. Start by disguising the elastic band by adding a scarf/tie/bow tie/feather boa to the puppet. Add yarn or ribbon for hair, buttons & googly eyes for eyes, a bead for the nose & cut out some felt for the mouth. We used a hot glue gun to attach all of these (except the felt). Tacky clear craft glue would also work. Ribbons can be attached using school or wood glue. Add further decorations such as sequins, feathers and cut felt shapes. Kids could even try to make cardboard hats or wings – anything is possible! To make the hands, draw and cut four simplified hand shapes out of cardboard & hot glue them together to make 2 thick hands. Add a wooden skewer to one of the hands before gluing to be able to manipulate it. Then hot-glue the hands to the corners of the puppet poncho. 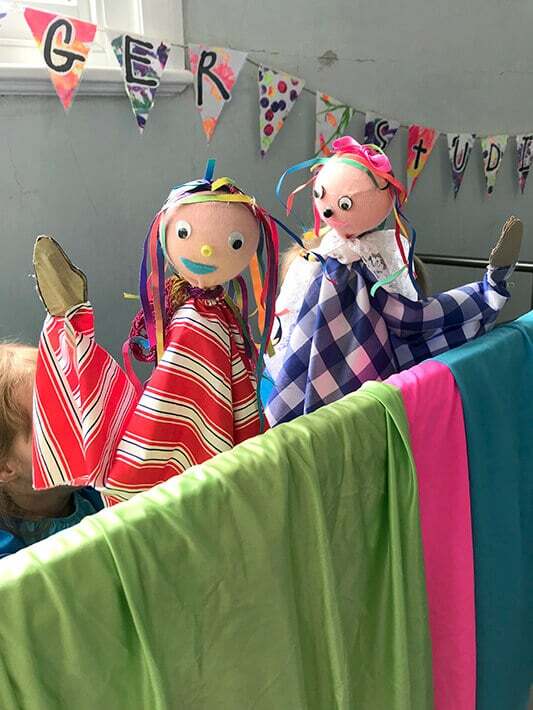 This allows kids to hold up their puppets by the dowel with one hand and move around one of the puppet’s hands whilst the other hand hangs free. 4. Play with your puppet! Now for the fun part! Why not set up a corner of the room as a puppet theatre? A couple of chairs with a blanket thrown over will do, or even a coffee table on its side. Kids adore performing with their puppets and I’m always surprised at the inventive voices and characters they create. Have fun!